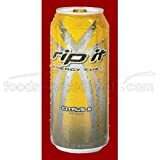 Rip It Energy Drink is a discount energy drink made by Sundance Beverage Company. It comes in over 18 flavor variations and some have differing caffeine content. Rip It has been reformulating their product line. It looks like most of their drinks have no more than 160 mg of caffeine now. Previously, many flavors had 200+ milligrams of caffeine per can. Rip It isn't recommended for children, those with certain health conditions, or those sensitive to caffeine. Rip It also makes an energy shot listed here. 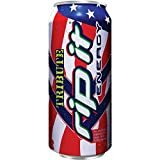 (Rip It Power) Carbonated water, high fructose corn syrup, taurine, citric acid, natural flavor, sodium citrate, inositol, caffeine, sodium benzoate and potassium sorbate (preservatives), salt, ascorbic acid (vitamin C), guarana seed extract, ester gum, pyridoxine hydrochloride (vitamin B6), yellow 5, folic acid, yellow 6, cyanocobalamin (bitamin B12). Rip It Energy Drink contains 10.00 mgs of caffeine per fluid ounce (33.81mg/100 ml).